Holy Apostles, located in the charming and historic town of Cromwell, CT, offers a faithfully Catholic, 100% online and on-campus liberal arts degree program for undergraduate students, as well as 100% online graduate degree programs in Philosophy, Theology, and Pastoral Studies. With its option to take all classes online and our exceptional affordability, we invite you to Live Your Mission at Holy Apostles! Location – Holy Apostles is located in Cromwell, Connecticut, just 20 minutes south of Hartford and 10 minutes north of Middletown. The campus includes 40 acres of beautiful land along the Connecticut River and is easily accessible by public transportation. 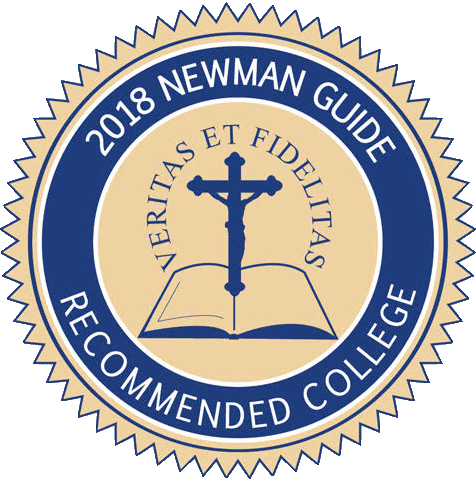 Holy Apostles is a Cardinal Newman Guide College. Holy Apostles believes a faithful Catholic education should be accessible and affordable for everyone. This drives our mission to provide the finest Catholic undergraduate and graduate education in a way that is convenient and affordable. Only Holy Apostles offers all three in one! At only $320/credit hour, our tuition is ranked over 72% more affordable than the average Liberal Arts College in the Country. We believe that a debt-free education is a gift to our students and their families as well as to the Church and society at large. Holy Apostles and its faculty are faithful to the Magisterium. Daily Mass, the Sacrament of Confession, and Adoration are offered at our Cromwell campus. Online courses incorporate Lectio Divina, prayer, and sacred art and music to foster the spirituality of our online students. We are one of the few institutions where seminarians, consecrated and lay students from around the globe attend the same classes growing in appreciation of each other’s vocation and calling, nurturing the beauty and value of vocations among the laity – on an international basis. Our students have the flexibility to study 100% online, which allows them to study anywhere at any time to meet the demands of their busy schedules. Earn your AA in 1.3 years, BA in 2.6 years and MA in 1.3 years! The student body has forged a strong sense of community and family as evidenced by their robust activities together. Most students participate in several sports daily at lunchtime. There are eat-outs at different restaurants; movie, pizza and game nights; hiking around CT. trails and beaches. Students all meet at Catholic Underground on campus each month. They participate in a choir program with the seminarians as well as a Latin schola. A very large joint representation of the student body takes part in the March for Life in January. The student-run Holy Apostles Life League, which coordinates pro-life activities, is quite active. Its activities include a prayer vigil on Saturday mornings at one of the abortion clinics in Hartford during the academic year, followed by the Mass of Mercy in the seminary chapel. Our end of semester and end of year celebrations see a large number of participants from the students and their families for Mass, dinner and evening entertainment including talent shows. In sum, this is a unique and positive dimension of Holy Apostles: the experience of the praying, studying and working together of those called to priesthood, to the lay faithful and to consecrated life. In fact, we refer to ourselves as a mini ecclesia. The fact of relatively small classes and very solicitous teachers gives the opportunity for each student to be well known and to be addressed personally on their faith journey. Established in the fall of 2006, the Dead Philosophers Society of Holy Apostles seeks to strengthen the community of online and on-campus students within the philosophy and theology programs. Membership is free of charge and is open to all undergraduates, graduates & friends of Holy Apostles. Holy Apostles has daily Mass at Our Lady Queen of the Apostles Chapel. The 7:00 a.m. Mass is attended by the seminarians, sisters, lay students and members of the faculty and staff. The 10 a.m. Sunday Mass is open to all. The Sacrament of Confession is available before Mass and two afternoons a week. There is a daily Holy Hour with the exposition of the Blessed Sacrament, as well as 24-hour adoration beginning every Thursday evening through Sunday morning. Students also have the option of participating in Mass and other spiritual activities, including perpetual adoration, at nearby St. John Church in Cromwell. The parish is staffed by Conventual Franciscan Friars. Holy Apostles entices students with its modest but picturesque and peaceful campus. It is also historic; the oldest building was erected in 1751. The campus is wooded, and students and visitors can walk to the Connecticut River and enjoy the campus’ trail known as the Tree Walk. Residential facilities for lay students are not available on campus. Some students taking on-campus classes share local apartments, but most commute from their homes. To help students with local housing, the admissions director works with local realtors and homeowners. Cromwell is a town of 13,500 people that is 15 minutes from the state capital of Hartford and about 30 minutes from New Haven. The quiet town also is safe, with minimal violent crime and a very low crime rate that is about 40 percent lower than the national crime index. The mission of Holy Apostles College & Seminary is to cultivate lay, consecrated and ordained missionary disciples for the purpose of evangelization. In addition to formal education, Holy Apostles has five specific goals in mind to encourage the full spiritual, emotional and psychological development of each of its students. To maintain excellence in teaching/learning, research/discovery, and service/engagement through the Liberal Arts, Philosophy and Theology. To guide students to integrate their search for truth with a personal relationship with Jesus Christ, the Fount of Truth. To animate the entire college and seminary experience with a recognizable, distinctive, unambiguously Catholic spirit. To assist students to formulate a coherent worldview based on faith and reason. To instill in students a devotion to liturgy, prayer, and service as well as excellence in academics. The Eucharist is the center of seminary life for those on campus, which radiates into all the programs we offer, for both our commuter students and those studying through our distance learning programs. As we are a college and seminary, Holy Apostles is one of the very few Catholic colleges in America where lay students and seminarians attend many of the same classes – both on-campus and online.